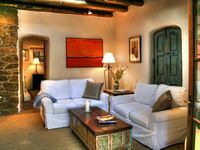 Property 22: East side light-filled adobe w/ private courtyard. 5 star ratings for 5 years! Property 32: Historic Santa Fe casita close to all sites. Property 41: NEW! 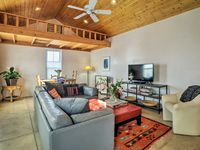 Centrally Located Santa Fe Cottage - Hot Tub! Fantastic location! Short walk to coffee shop and Canyon Rd. 15 min walk to Plaza. Lovely courtyard - enjoyed eating on patio by the kiva fireplace then a soak in hot tub. House is furnished beautifully, comfortably and had all we needed. Fell in love with Santa Fe and Casa de la Boda.